This blow up fan specializes in blowing up inflatables. Whether that be a bounce house, advertising tool, large slide, or an obstacle course, whatever you need blown up, this fan will accomplish it for you. It is the most powerful of all the inflatable blowers we have to offer. In fact, the 1.5 HP motor is not only the most powerful, but it also turns out the most air flow, at 1180 CFM. 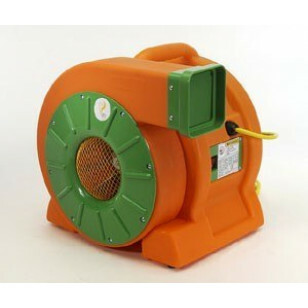 If you are looking more economical units, take a look at our /air-movers/inflatable-blowers/childrens-bounce-house-inflatable-blower.html" title="Children's Bounce House Inflatable Blower">bounce house inflatable blower, and our inflatable blower fan. If you are looking for more traditional style fans, take a look at our whistle carpet dryers, and our axial drying fans. 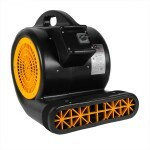 1.5 horsepower blower moves enough air to quickly inflate large items for continuous use. Plastic feet located on the base guard the unit from scratching any type of flooring. 25' power cord allows you plenty of room to maneuver the fan either indoors or outdoors. Fan blows up most inflatables within seconds for instant enjoyment. State of the art construction, with safety screens protect the motor for long life. This is a review for the Blow Up Fan for Inflatables.